Persistent dryness, scratchiness and a burning sensation on your eyes are common symptoms of dry eye syndrome. These symptoms alone may be enough for your eye doctor in East Orlando, FL to diagnose dry eye syndrome. Sometimes, he or she may want to measure the amount of tears in your eyes. A thin strip of filter paper placed at the edge of the eye, called a Schirmer test, is one way of measuring this. Some people with dry eyes also experience a "foreign body sensation” – the feeling that something is in the eye. And it may seem odd, but sometimes dry eye syndrome can cause watery eyes, because the excessive dryness works to overstimulate production of the watery component of your eye's tears. In dry eye syndrome, the tear glands that moisturize the eye don't produce enough tears, or the tears have a chemical composition that causes them to evaporate too quickly. As a side effect of many medications, such as antihistamines, antidepressants, certain blood pressure medicines, Parkinson's medications and birth control pills. If your home or office has air conditioning or a dry heating system, that too can dry out your eyes. Another cause is insufficient blinking, such as when you're staring at a computer screen all day. Dry eyes are also associated with certain systemic diseases such as lupus, rheumatoid arthritis, rosacea or Sjogren's Syndrome (a triad of dry eyes, dry mouth, and rheumatoid arthritis or lupus). Tears, produced by glands around the eye, are necessary for providing clear vision and maintaining the health of the eye’s front surface. Normally, the eye constantly bathes itself in tears to provide lubrication and protection; tears also reduce the risk of eye infection and wash away foreign matter in the eye. People with dry eyes either do not produce enough tears or have a poor quality of tears. EyePromise EZ Tears contains nine essential ingredients in a formulation specifically designed to address dry eye from the inside. All EyePromise products are made in the U.S. from natural ingredients, and recommended by leading eyecare professionals. 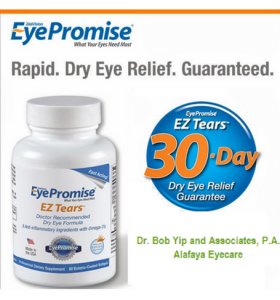 As diet affects eye health, eye vitamins such as EyePromise EZ Tears can provide rapid relief to soothe eye irritation since containing nutrients such as Omega-3 fatty acids, vitamin A, E, and nine other ingredients to address the inflammation and improve the quality of the tears produced. EZ Tears comes with an unconditional 30-day, money-back guarantee. If you are experiencing dry eye symptoms, please do not hesitate to contact us at 407-737-8686. UCF & other College student discounts available. Your eyecare practitioner may recommend artificial tears, which are lubricating eye drops that may alleviate the dry, scratchy feeling and foreign body sensation of dry eye. Prescription eye drops for dry eye go one step further: they help increase your tear production. In some cases, your East Orlando optometrist may also prescribe a steroid for more immediate short-term relief. Check the label, but better yet, check with your doctor before buying any over-the-counter eye drops. Dr. Yip will know which formulas are effective and long-lasting and which are not, as well as which eye drops will work with your contact lenses. For more significant cases of dry eye, your eye care expert may recommend punctal plugs. These tiny devices are inserted in ducts in your lids to slow the drainage of tears away from your eyes, thereby keeping your eyes more moist. 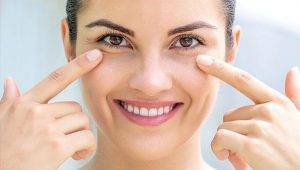 Treating any underlying eyelid disease, such as blepharitis, helps as well. This may call for antibiotic or steroid drops, plus frequent eyelid scrubs with an antibacterial shampoo. We also offer Xiidra for dry eyes. Is it Dry Eyes or Eye Allergies? Do you suffer from itchy, stinging, swollen or bloodshot eyes? While a number of causes can be to blame, the two most common reasons for eye irritation are dry eye syndrome and eye allergies.